The Republic of Ireland suffered cruellest of World Cup exits as France went through with a goal which should have been disallowed for handball. 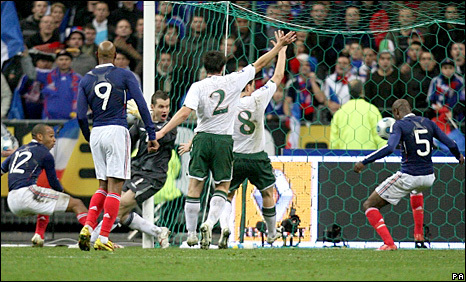 Thierry Henry clearly handled before playing the ball for William Gallas to score the equaliser which saw France win the play-off 2-1 on aggregate. 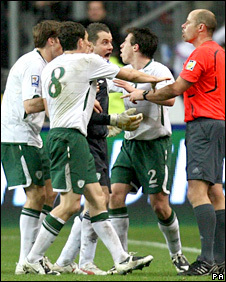 The Irish led from the 33rd minute after Republic skipper Robbie Keane shot past Hugo Lloris from 10 yards. But Giovanni Trapattoni's side went out to the controversial extra-time winner. The debate will rage on about the goal that took France to the 2010 finals in South Africa and how the officials failed to spot such a blatant handball and will likely reignite the debate about video technology being introduced. After the anger about Fifa's decision to seed the play-offs, the Irish will feel robbed and unfairly treated when up against a bigger nation. Republic players protested strongly when Swedish referee Martin Hansson, who was hampered in his sighting of the incident, gave the goal. It is hard to imagine a more heartbreaking end to Ireland's attempt to reach the finals after going through their group, which included champions Italy, unbeaten. France, in the stadium where they won the 1998 World Cup, started the match more confidently. But they suffered a ninth-minute blow when Julien Escude was forced from the field with a head injury and was replaced by his Sevilla team-mate Sebastien Squillaci. Squillaci had a chance in the 20th minute from Henry's cross but sent his header over the crossbar. For the Republic, Kevin Doyle also went close from a Liam Lawrence cross but failed to make good enough contact with a close-range header under pressure from Gallas. Ireland were looking more and more dangerous, and when the goal came it was created and finished by three of their experienced stars aiming to play in the World Cup finals for a second time. Kevin Kilbane played a neat ball through to Damien Duff on the left and he chased to the byline to pull it back for Keane. The Republic's record goalscorer accurately side-footed beyond the dive of goalkeeper Lloris from 10 yards for his 41st international goal in 96 appearances. Suddenly, the Irish dream was on and the French team and supporters were stunned. Half-time arrived with Irish confidence soaring, and their keeper Shay Given so far untroubled. They started the second half encouragingly and a chance fell the way of Manchester United defender John O'Shea, who shot rashly over from a tight angle. A second goal for Trapattoni's side would have left the French needing two to make the finals. The big chance came in the 61st minute when Duff was put through by Lawrence's fine pass. The Fulham winger attempted to place his shot past Lloris but defender Bacary Sanga got a slight deflection on the ball and the home keeper was able to save diving to his right. Manchester United's Darron Gibson replaced the injured Glenn Whelan in the Irish midfield and then O'Shea hobbled off and Paul McShane came on. As the half wore on, France gained the upper hand with Nicolas Anelka flicking a header wide of the far post. But then Keane was almost in again, only to run out of space after getting past Lloris with the ball going behind for a goal-kick. France surged forward late in the game, trying to grab the goal which would have sent them to South Africa without the need for extra-time. That would have been cruel on the Irish, who deservedly remained on terms at the end of the 90 minutes. French fans were convinced the 1998 winners should have had a penalty in the first period of extra-time when Anelka went through and fell as keeper Given came out. But, instead of pointing to the spot, the Swedish official ruled the Chelsea forward had not been fouled and gave a goal-kick. If Ireland were a shade fortunate then, they were on the wrong end of an outrageous verdict minutes later as Gallas scored the disputed goal. The arguments may rage on, but the Republic of Ireland's World Cup journey is at an end. France: Lloris, Sagna, Gallas, Escude (Squillaci 9), Evra, Lassana Diarra, Alou Diarra, Gourcuff (Malouda 87), Anelka, Gignac (Govou 57), Henry. Subs Not Used: Mandanda, Remy, Sissoko, Benzema. Booked: Alou Diarra, Malouda, Govou. Rep of Ireland: Given, O'Shea (McShane 66), St. Ledger, Dunne, Kilbane, Lawrence (McGeady 106), Whelan (Gibson 63), Andrews, Duff, Doyle, Keane. Subs Not Used: Joe Murphy, Kelly, Hunt, Best.